Gohar Dashti will speak about her approach to art-making and how all of her works share the same conceptual foundation, asking the question “Where is this connection coming from?” Dashti will elaborate on her links to documentary photography, sharing behind-the-scenes details of how here works are created. 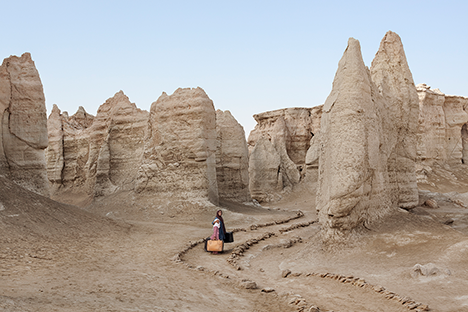 Images from Gohar Dashti’s series Stateless are part of the exhibition, In Transit, on view at the SDSU Downtown Gallery from April 18 – July14, 2019. This lecture is presented in collaboration with ART 104, Artists + Designers in Real Time. Gohar Dashti received her M.A. in Photography from the Fine Art University of Tehran in 2005. 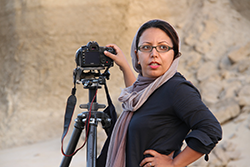 After studying photography in Iran, she has spent the last 12 years focusing her practice on concerns of social issues with particular references to history and culture through a convergence of interest in anthropology and sociology. She tries with her own means to express the world around her. Her starting point is always her surroundings, her memory, but with her very personal perception of things. She tries to trace her relationship to society and the world in its most sensitive way. Her practice continuously develops from life events and connection between the personal and the universal, the political and the fantasized. All visitors MUST purchase a parking ticket at $3 per hour. View SDSU Campus Map here. Pay in person at the kiosk on Level 8 of Lot 12 or with the PayByPhone app here. Once parked, go to parking level 4 and cross the bridge towards campus. Walk directly through the West Commons. Cross “Scripps Terrace drive and walk up “hilltop way”. At the top of the hill, turn left. Hepner Hall is the iconic building with the arch and round turrets. HH-221 is on the second floor and faces the Campanile walkway.